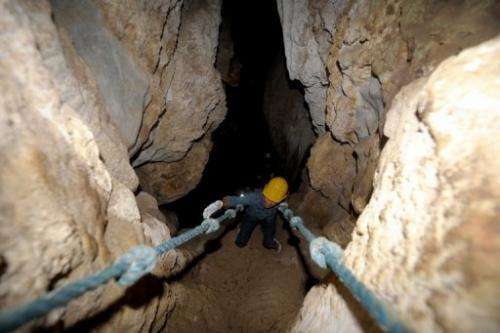 This file photo, taken in 2011, shows a tourist exploring a cave on the western Philippine island of Palawan. The Philippine government has put 158 caves under the protection of the environment department to safeguard them from treasure-hunters, vandals and looters, it was announced on Saturday. The Department of Environment and Natural Resources said the caves, which are scattered across the country, would be protected both by the department and local governments. Environment Secretary Ramon Paje said caves were a valuable natural resource for their scientific, historical and cultural value. "Yet they are also in constant threat from destructive human activities like vandalism, treasure hunting, pollution and illegal extraction of resources," he said in a statement. Many caves in the Philippines have been illegally excavated by people searching for treasure, valuable minerals, artefacts to be sold as antiques or even stalagmites and stalactites which are sold as decorations. Under the order, 118 caves have been classified as being closed to the general public because they are too dangerous or contain valuable geological formations, threatened species or historical artefacts. Such caves will be accessible only by scientists, researchers or trained spelunkers, the department said. Another 40 caves were listed as "generally safe," and remain open to the general public to visit or for activities such as collecting guano and bird's nests for soup, the department added. The department's wildlife protection bureau has counted at least 1,756 caves scattered across the Southeast Asian archipelago but only a small number have been checked and classified by authorities.